Just about an hour south of Jackson Hole, flows the New Fork, a small, intimate stream with undercut banks and numerous brush piles which provide excellent cover for German Brown Trout and a large population of aerobatic rainbows. This is not a beginner’s river, but can provide some great fishing for an intermediate or advanced fly fisherman and the chance to catch a trophy Brown. Since the New Fork is mostly on private land, there is no shore access and you will not see a lot of other boats here. 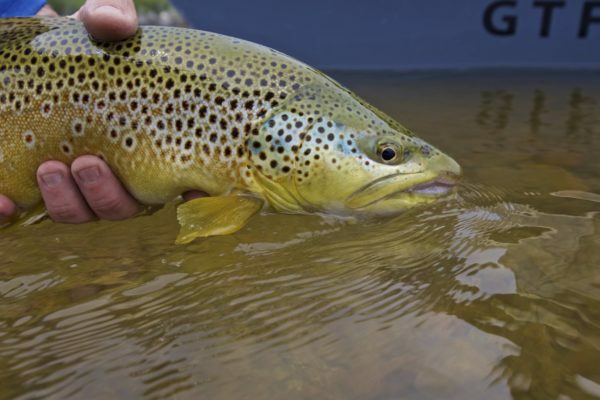 Our guides teach you how to work with nymphs and streamers and help you tie into some nice brown trout. For those who are experienced, the New Fork offers the challenge of a lifetime. See how well you fare on this exciting river. Find current conditions for the New Fork River on our New Fork River Fishing Report.